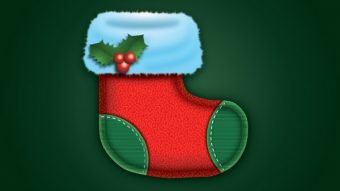 You’ll begin by creating the basic structure of the sock with basic shapes, then build up the details with gradients and effects. Let’s create a new document first. Make sure to set the dimensions to 600 x 600 pixels and the Color Mode to RGB. 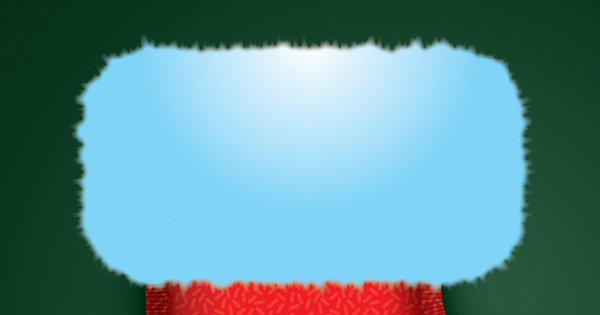 Use the Rectangle Tool (M) to draw a rectangle and fill it with the gradient for our background. 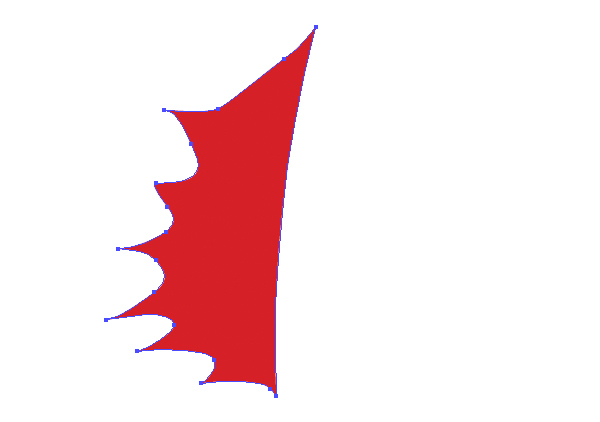 Pick the Pen Tool (P) and draw a shape as shown in the image below, then fill the shape with color #961A1E. 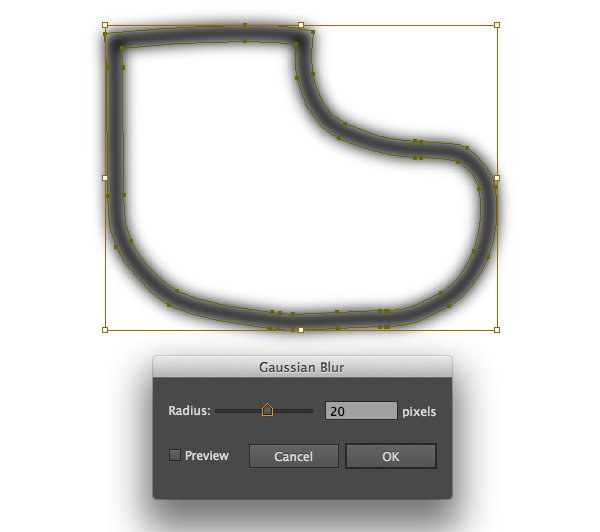 Duplicate (Ctrl / Cmd + C, Ctrl / Cmd + V) it and place a copy of the shape off to the side of the artboard, which we’ll use later. 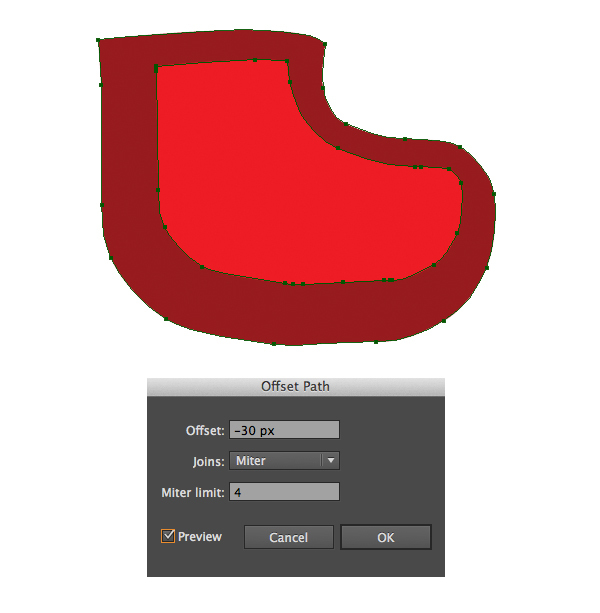 With the shape still selected, go to Object > Path > Offset Path and Enter a -30 px Offset and click OK. 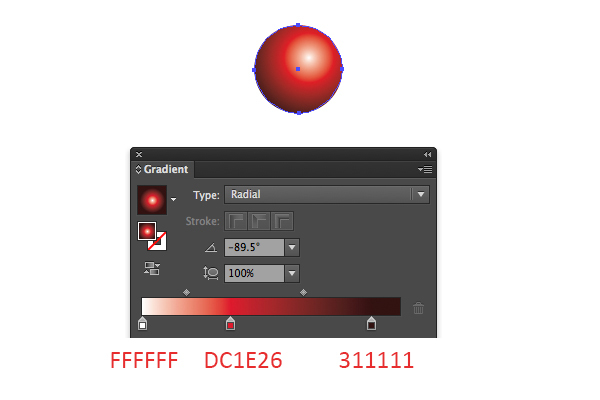 Select the resulting shape and place it as shown in the image below then change the color to #ED1C24. 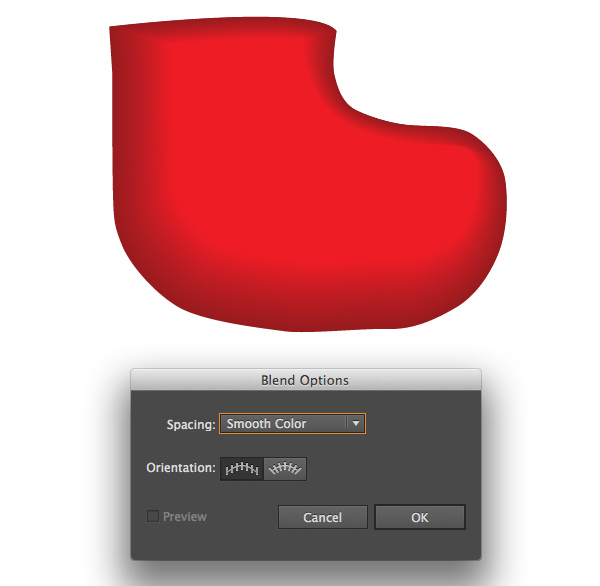 Reselect the shapes and go to Object > Blend > Blend Option > Make. 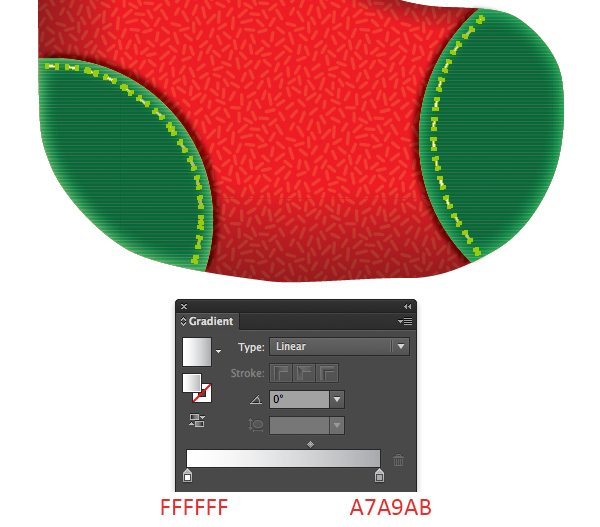 Back in previous step, I mentioned placing a copy of the sock shape outside the Artboard. Go ahead and grab a copy to work with. 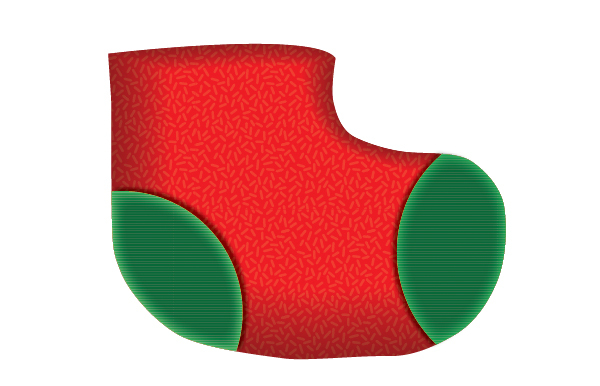 Place the copy shape in front of the sock and now we add the pattern to our copy shape. 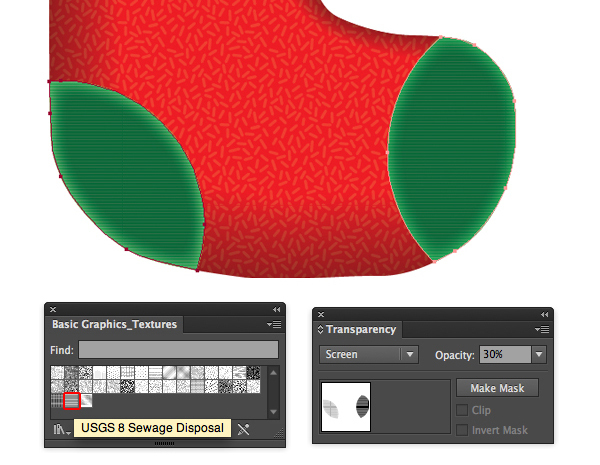 In the Swatches palette go to Open Swatch Library > Patterns > Basic Graphic_Textures. Then we apply Capsules for the copy. 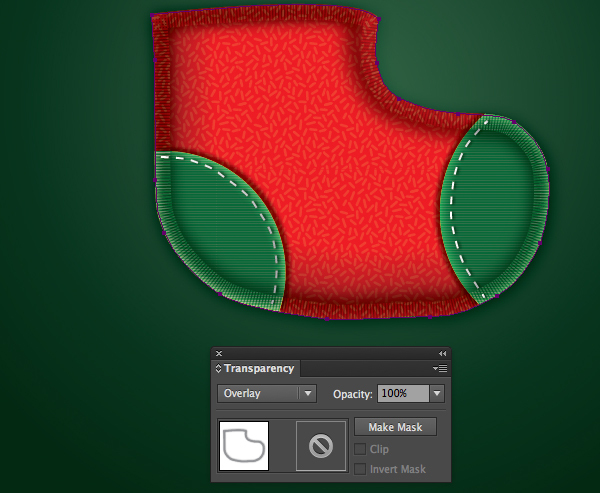 Apply Screen Blending Mode to the copy and lower Opacity = 10%. 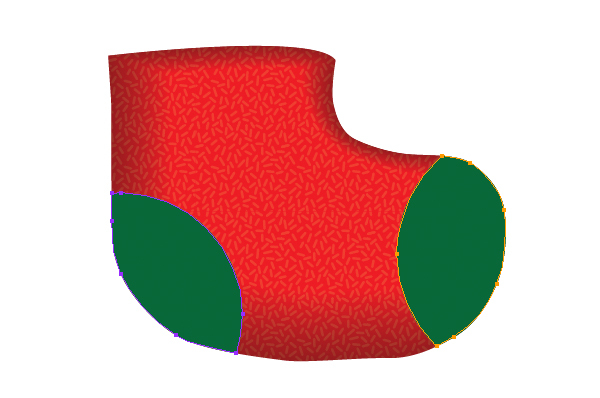 In this step, we will create a toe and heel pattern by using the Pen Tool (P) as shown in the image below. Fill them with color #006738. Duplicate them and place a copy of the shape off to the side of the artboard, which we’ll use later. 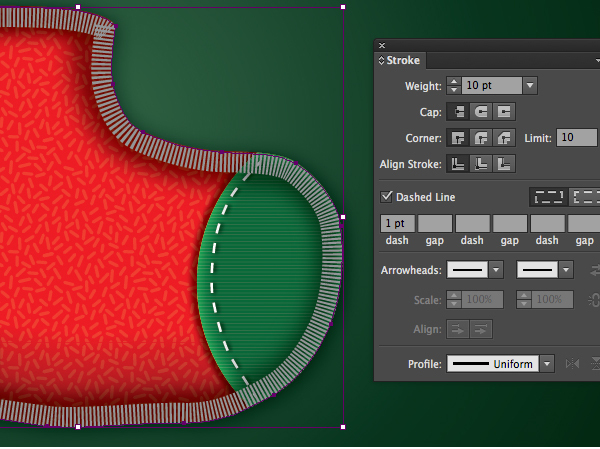 With the toe and heel pattern still selected, go to Effect > Stylize > Inner Glow and set the values. 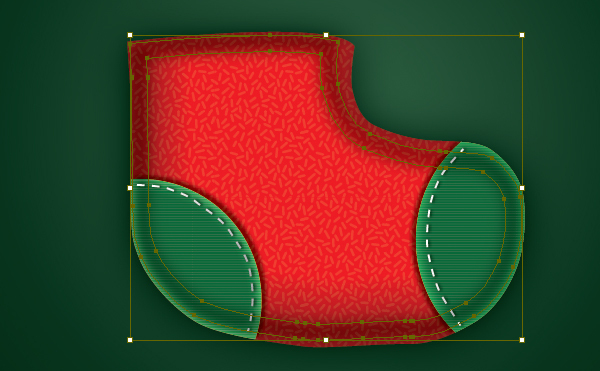 Now we grab the toe and heel pattern copy and place in front. 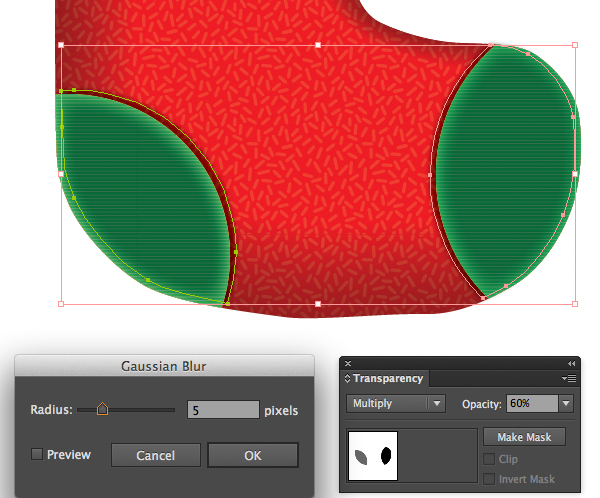 Don’t forget to duplicate them and place a copy of the shape off to the side of the artboard, which we’ll use later. 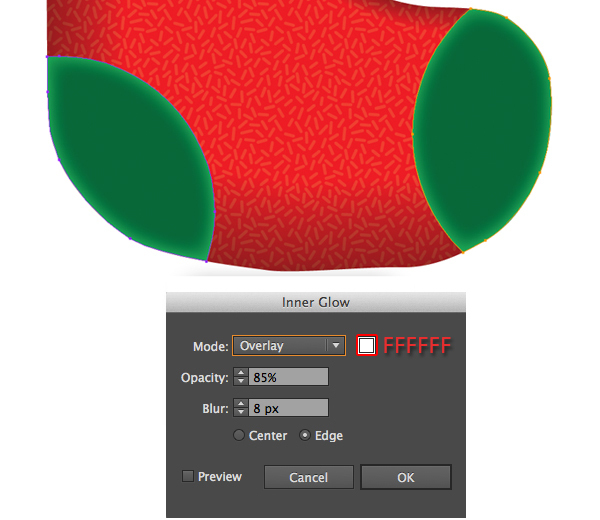 Open the Stroke palette and set the values, then go to Object > Expand Appearance. Now we fill the stitches with this gradient. 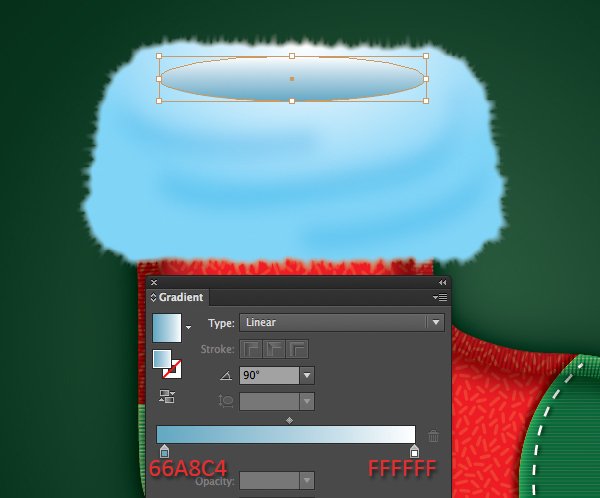 With the stitches still selected, go to Effect > Stylize > Drop Shadow and set the values. And we end up with a result like in this image below. 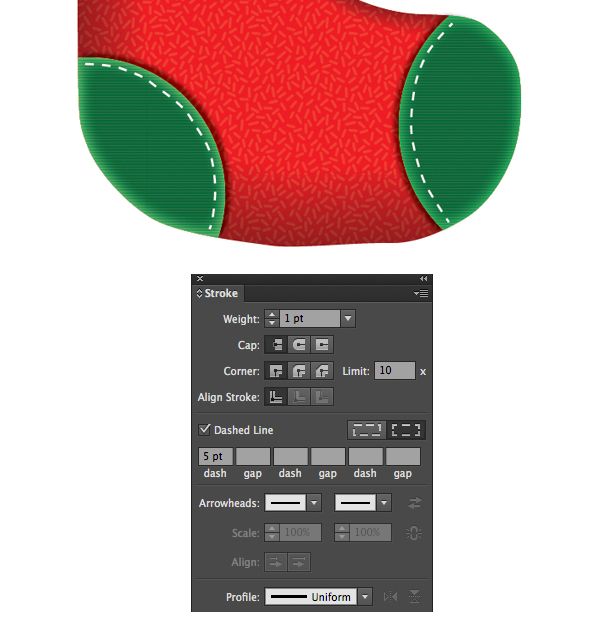 Back in Step 3, I mentioned placing a copy of the sock shape outside the Artboard. Go ahead and grab a copy to work with. 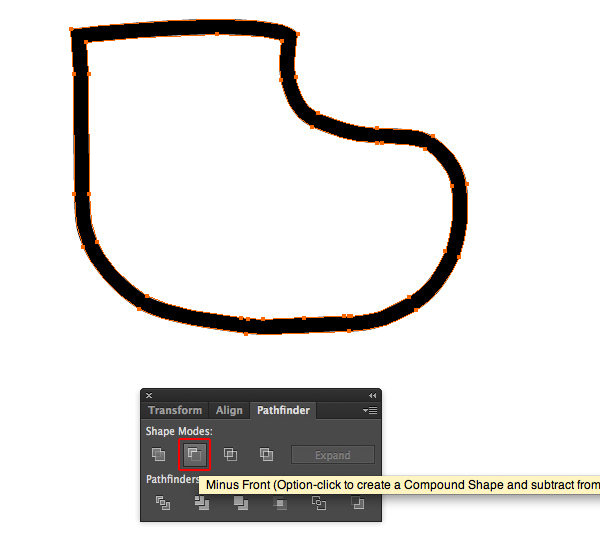 Duplicate it and place a copy of the shape off to the side of the artboard, which we’ll use later. Fill the copy with black color #000000. 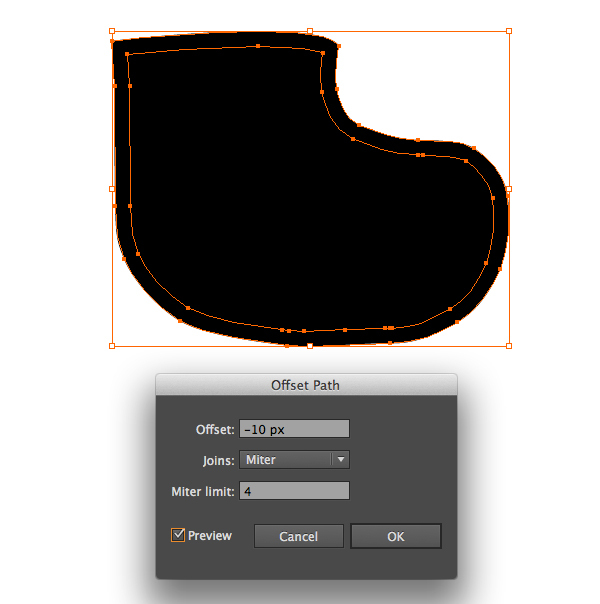 With the shape still selected, go to Object > Path > Offset Path and set the values. 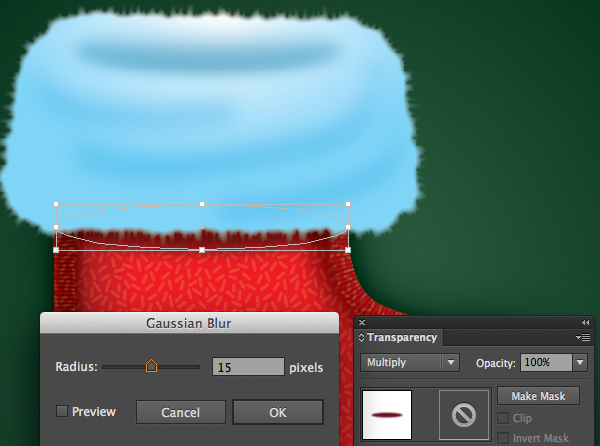 Reselect the new shape we have created and go to Effect > Blur > Gaussian Blur and set the value as in the image below. 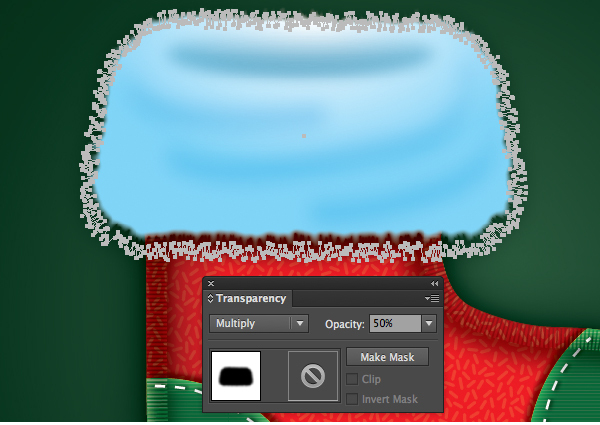 Then apply Multiply blending mode to it and lower Opacity = 50%. Now you place our new shape on the top layer. 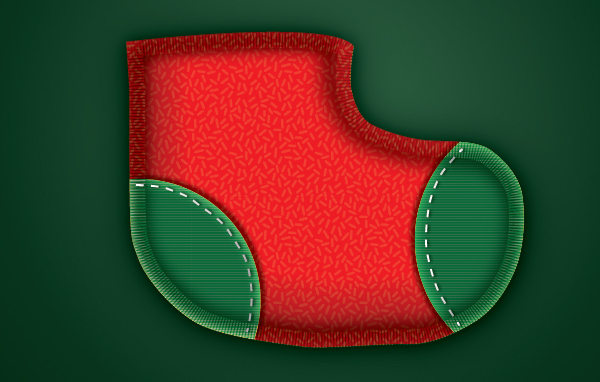 Back in Step 5, I mentioned placing a copy of the sock shape outside the Artboard. Go ahead and grab a copy to work with. 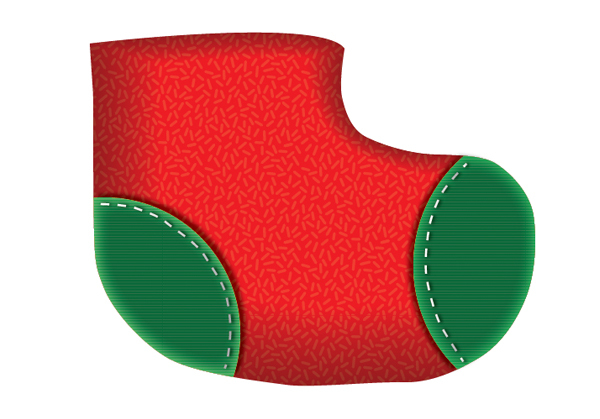 Now we fill the shape with no color but set Stroke = 10pt, and fill the color #939597 for the stroke. 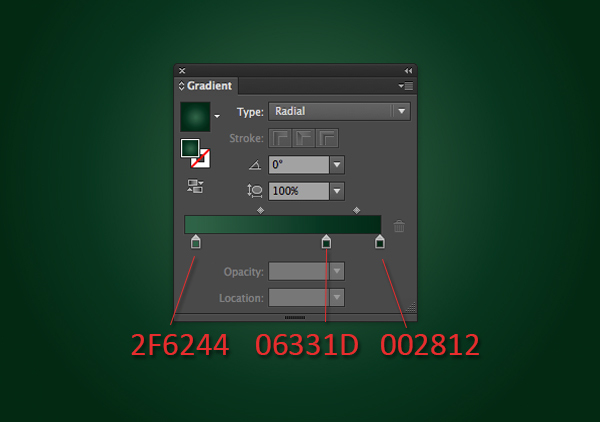 Then open Stroke palette and set the values as shown below. Now we apply Overlay blending mode to the stroke. You should get a result as in the image below. 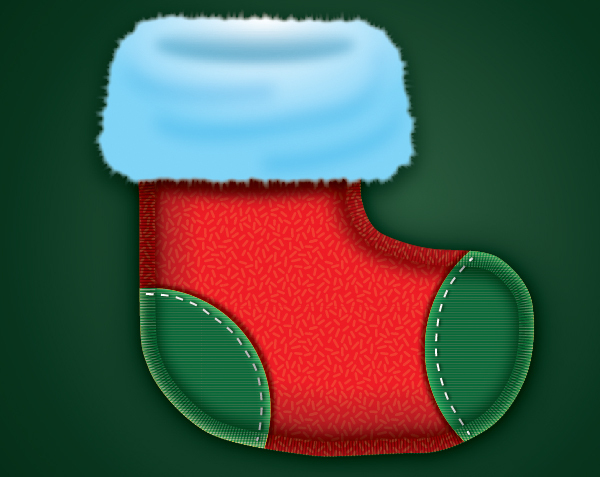 In this step, we will add a shadow for the sock. Go ahead and grab a sock copy and place it under the layers. 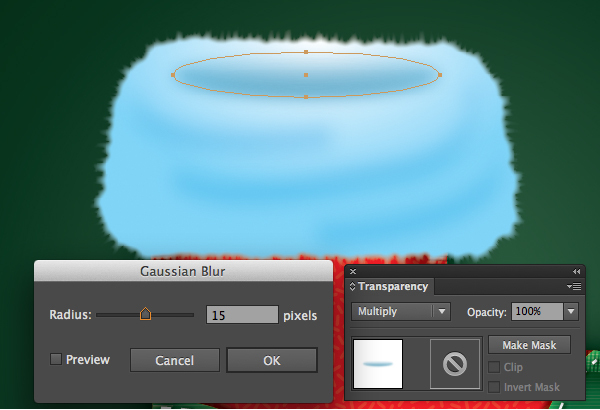 Fill it with black color #000000 then go to Effect > Blur > Gaussian Blur and set the values. 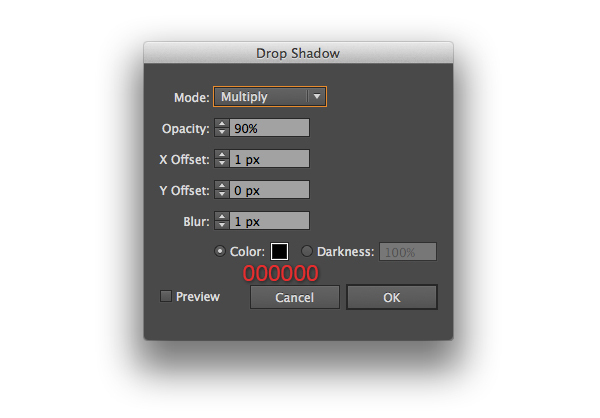 Apply Multiply blending mode for the shadow and set the Opacity = 80%. You should end up with a result like this. 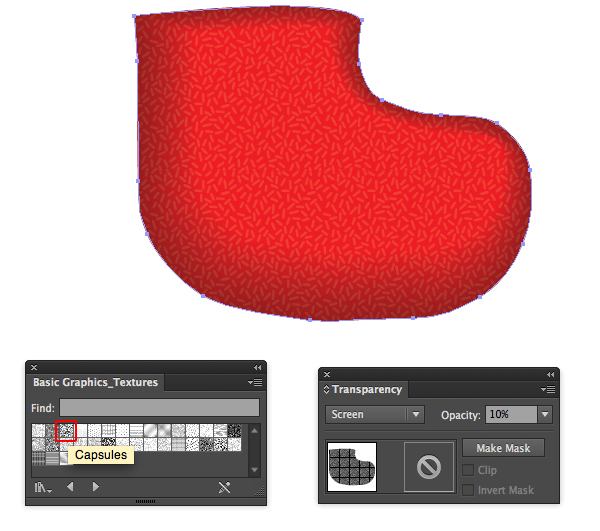 With the shape still selected, go to Effect > Distort & Transform > Roughen and set the values. 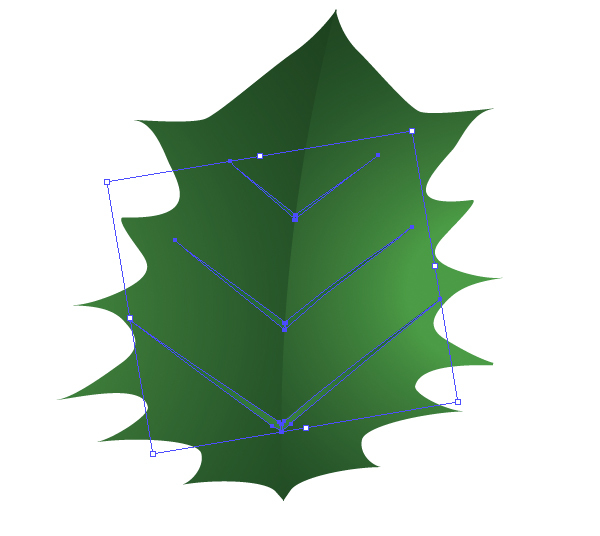 Make sure to expand the shape by going to Object > Expand Appearance. 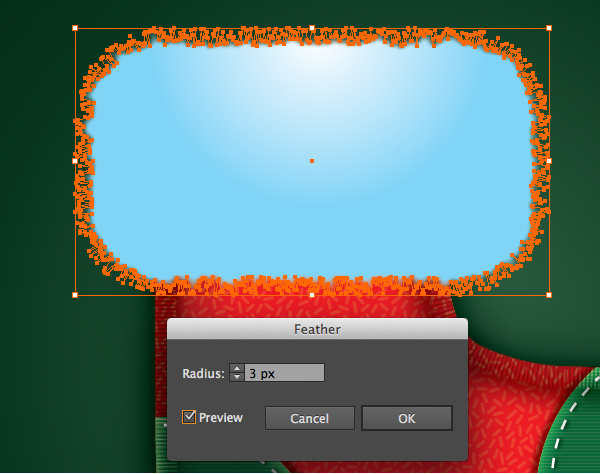 Reselect the fluffy part, then go to Effect > Style > Feather and set the values. Now I want distort the fluffy shape a little bit. 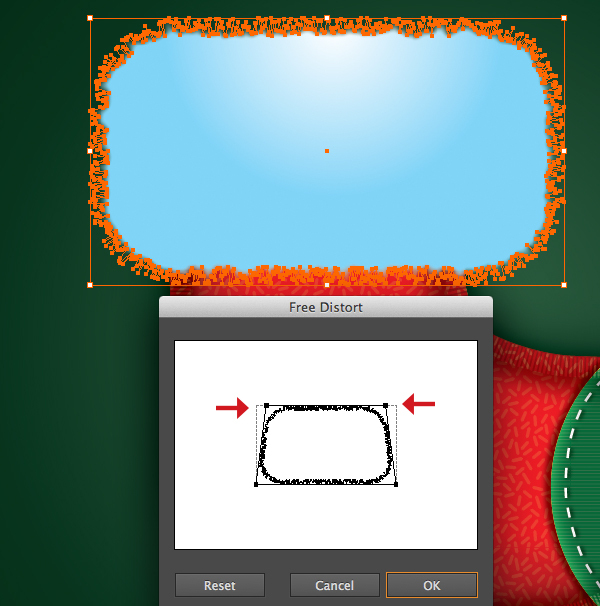 Reselect it and go to Effect > Distort & Transform > Free Distort. 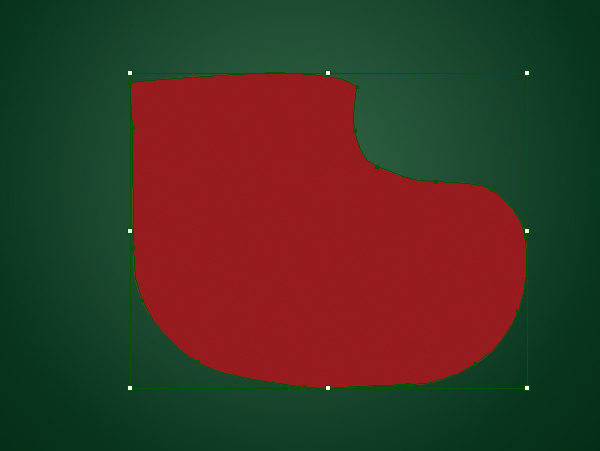 Then duplicate the new shape and place a copy of the shape off to the side of the artboard, which we’ll use later. In this step, we will add some wrinkles on the fluffy part. 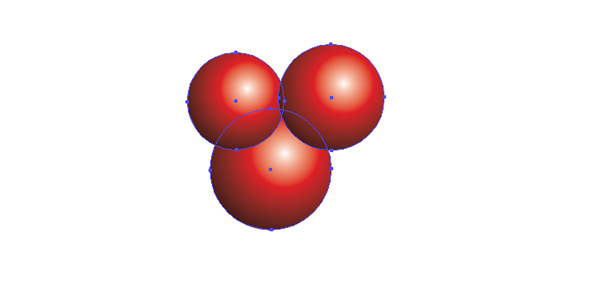 Just pick the Pen Tool (P) to draw some shapes as in the image below, then fill them with color #27A9E1. 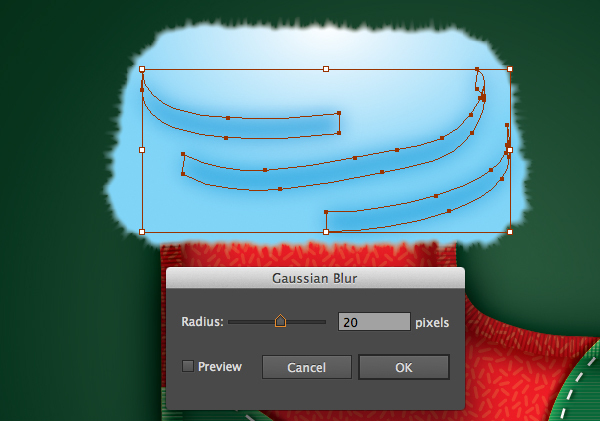 Make sure that the set of paths created in the previous step are still selected, then go to Effect > Blur > Gaussian Blur and set the value. Apply Multiply blending mode and lower Opacity = 30%. 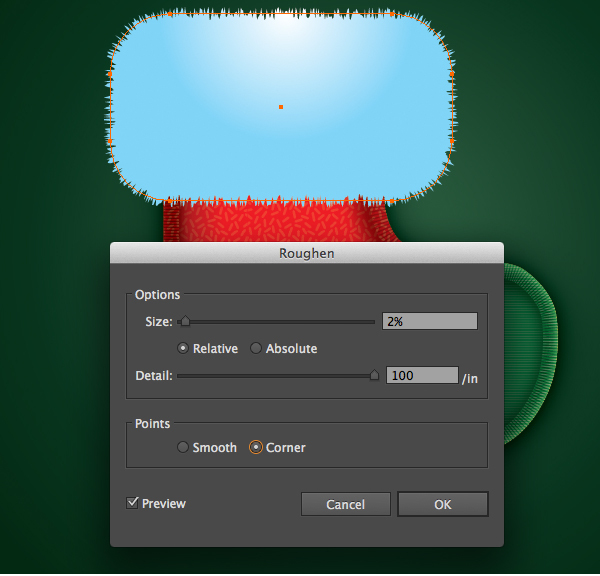 Add an ellipse on top of fluffy by using the Ellipse Tool (L) and fill it with this gradient. 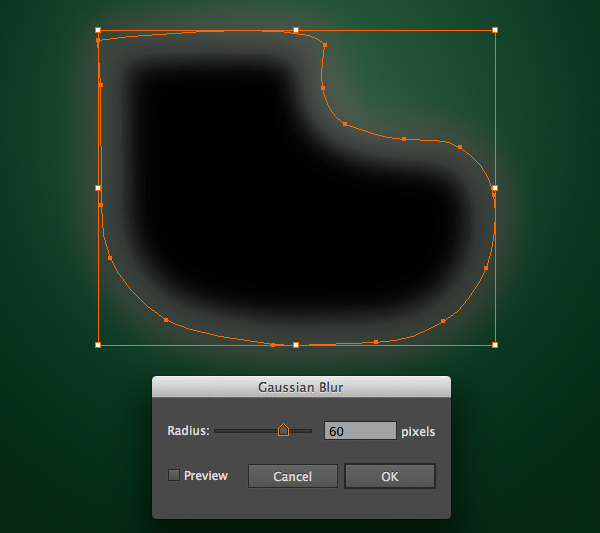 With the ellipse still selected, go to Effect > Blur > Gaussian Blur and set the value. Then apply Multiply blending mode to it. 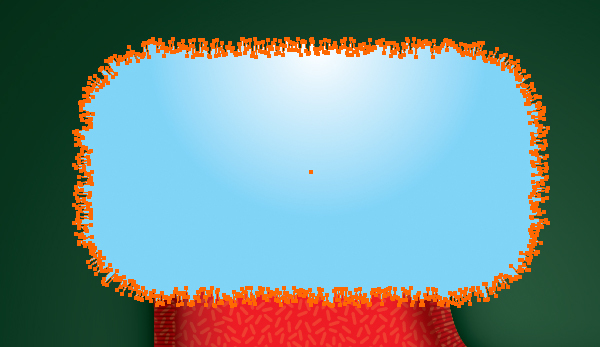 In this step, we create another ellipse and fill it with color #68141B, place it under fluffy. 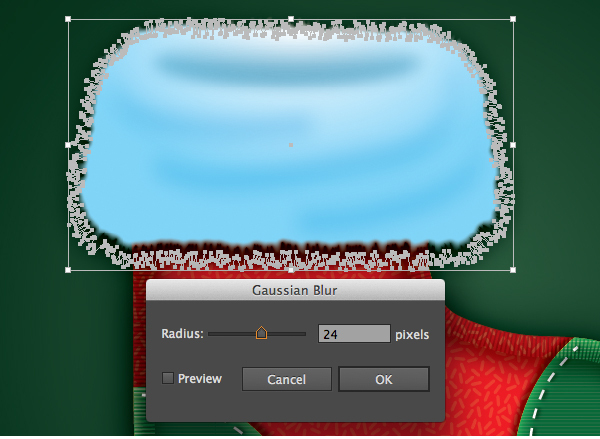 And go to Effect > Blur > Gaussian Blur and set the value. Then apply Multiply blending mode to it. Now we add shadow for fluffy. 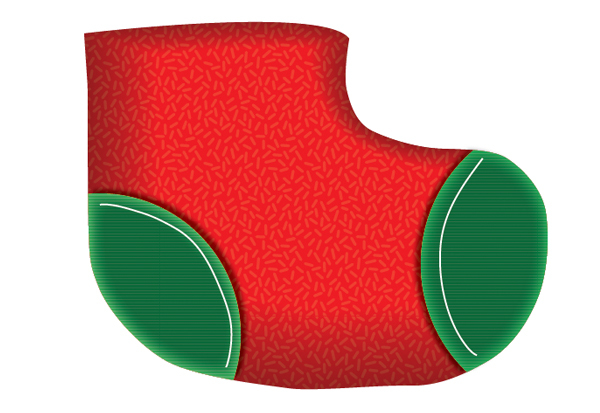 Back in Step 8, I mentioned placing a copy of the sock shape outside the Artboard. Go ahead and grab a copy to work with. Place the copy under the fluffy part. Fill it with black color #000000, then apply Gaussian Blur effect. 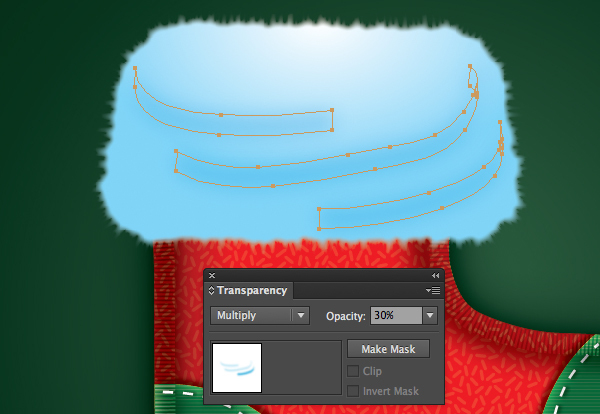 Apply Multiply blending mode to the shadow and lower Opacity = 50%. 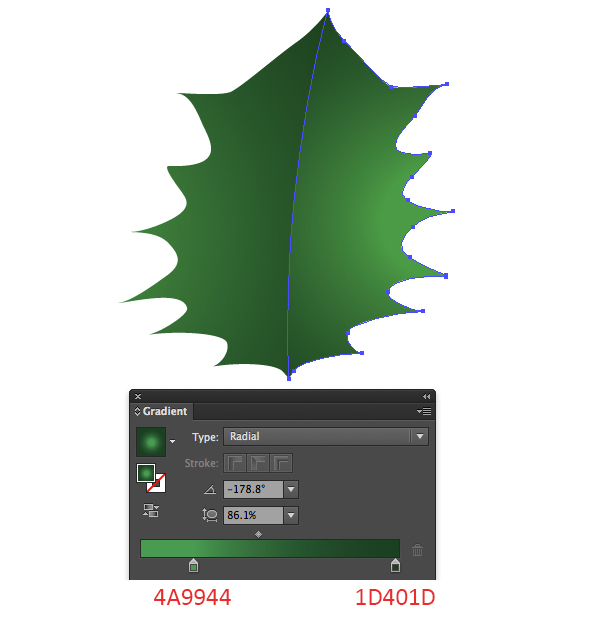 In this step, we will create Christmas holly. 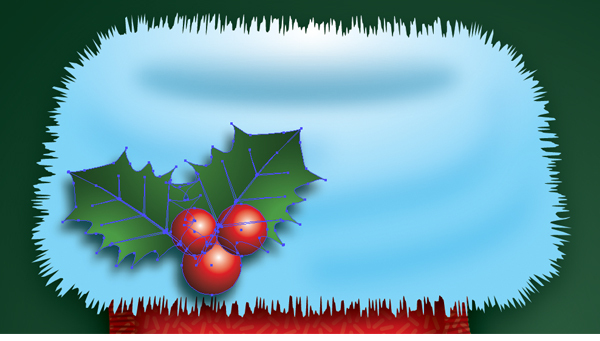 First, we pick the Ellipse Tool (P) and draw a circle for the holly berry, then fill it with this gradient. 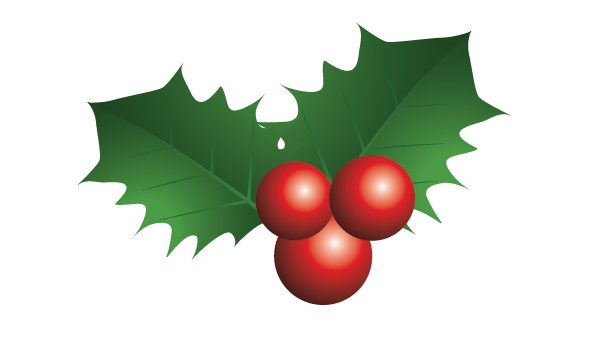 Duplicate (Ctrl / Cmd + C, Ctrl / Cmd +V ) two more holly berries and place them as shown below. 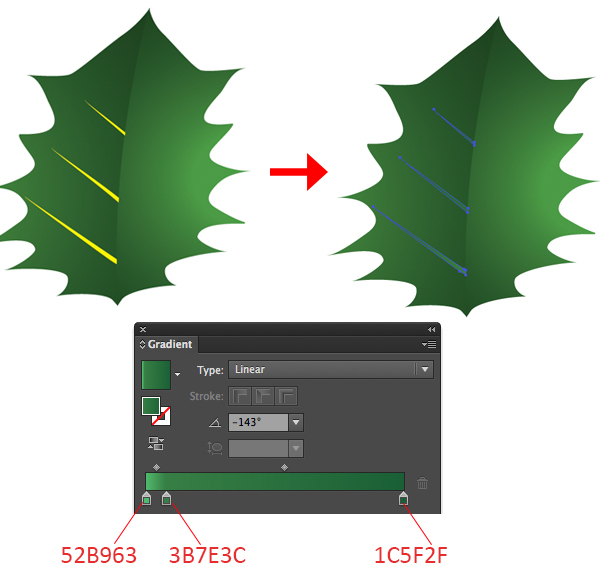 It’s time to create a Christmas leaf. 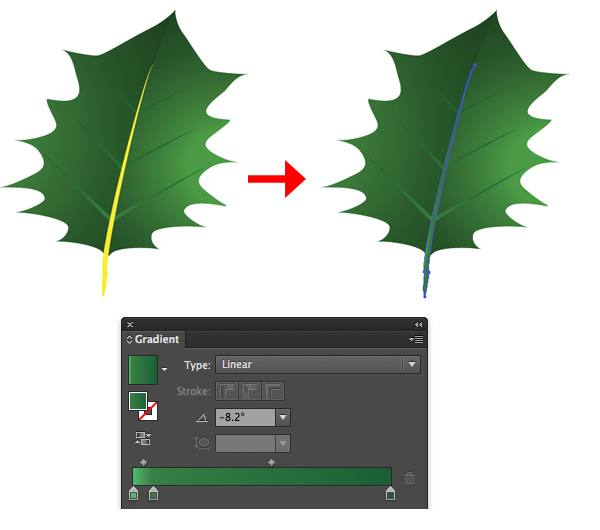 Pick the Pen Tool (P) to create half of the leaf. 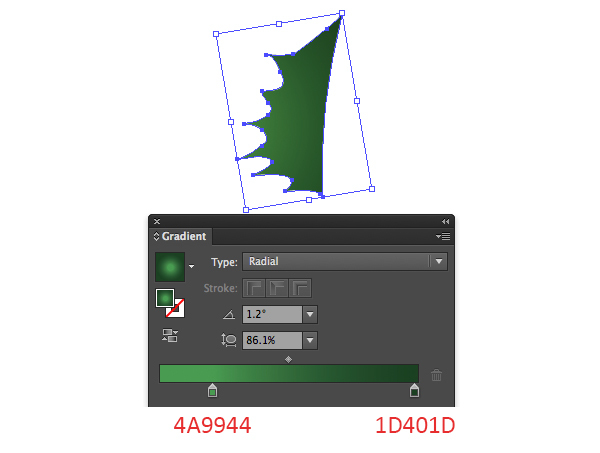 Apply this gradient for the half leaf. We continue to use the pen to create another half of the leaf. 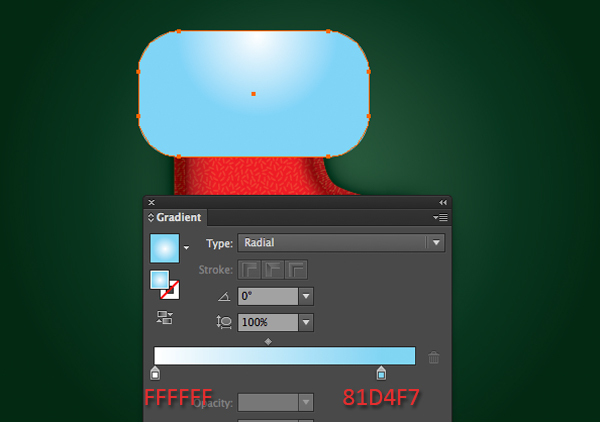 And we apply the same gradient as in the previous step. 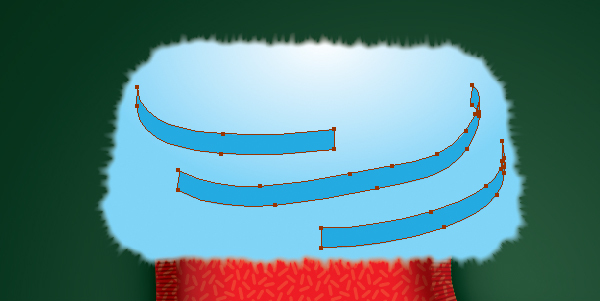 We continue to use the pen to create leaf veins and apply the gradient as shown below. 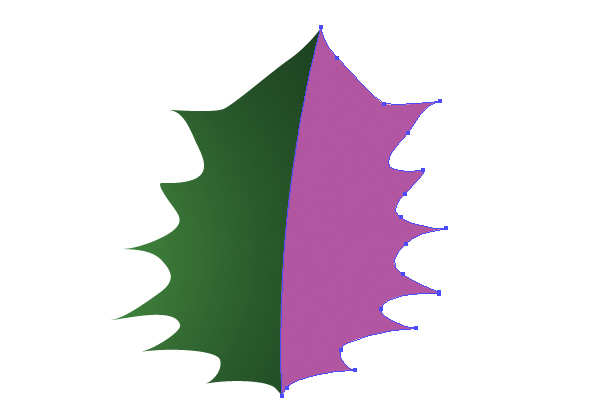 Group (Ctrl + G) all the leaf veins, duplicate them and place on the opposite side as in the image below. In this step, we will create leaf midrib. 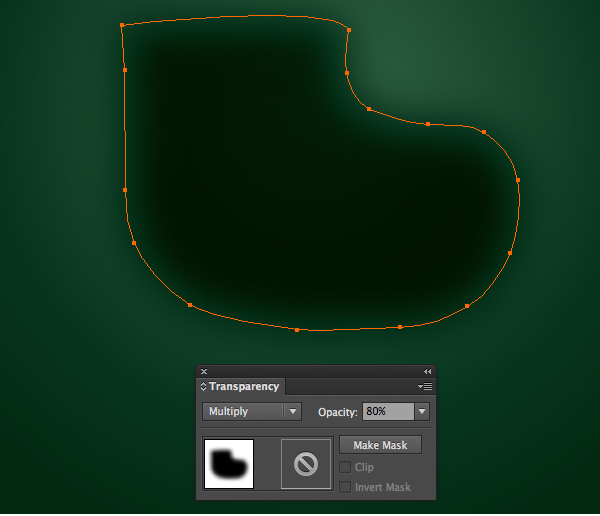 Just pick the Pen Tool (P) and draw a shape as in the image below, then apply the same gradient as Step 15 for midrib. Group (Ctrl + G) all the Christmas holly. Now you should end up with a result like this. 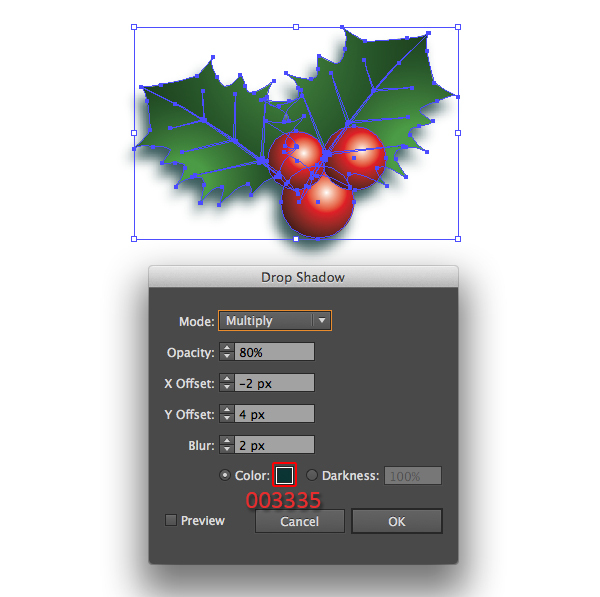 Reselect all the Christmas holly and go to Effect > Stylize > Drop Shadow and set the values. 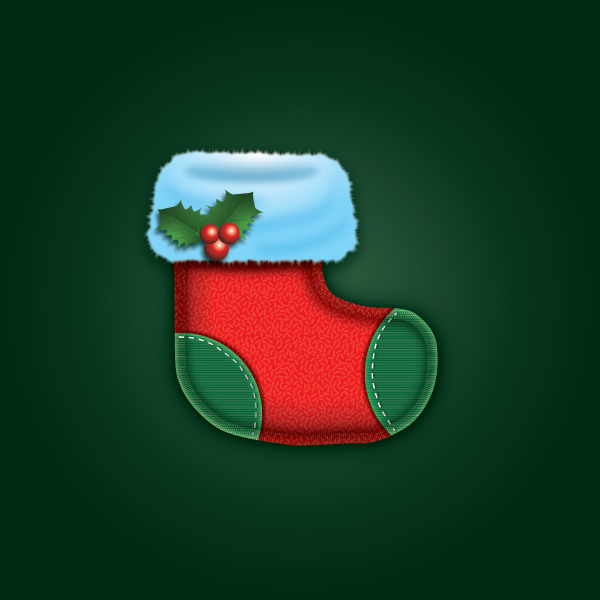 Place the Christmas holly like this.